Club Penguin Cheats by Mimo777 Club Penguin Cheats by Mimo777: EPF Message: Jet Pack Guy! What is the Jet Pack Guy's real name? I don't know about you but I think he needs a better name. Rodney. I shall call him Rodney. It's a nice name. What would you change the JPG's name to? i would call him jake or chase. Hi Mimo777. 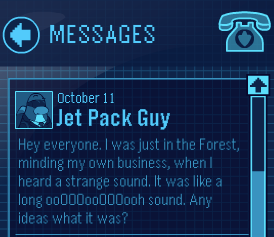 I would actually call him Chad The Jet Pack Guy, I think it sounds good. I would call jet pack guy Kevin! I shall call him Jimmy! Maybe he heard some people getting it on in the forest! nah fluffy, because fluffy is cute ok.